23 August 2017, Singapore – With less than a month to the 2017 FORMULA 1 SINGAPORE AIRLINES SINGAPORE GRAND PRIX (15 to 17 September), race promoter Singapore GP has lined up a wide range of treats for Formula 1® fans. Here are ten ways to rev up for the tenth edition of the Formula 1® night race this August and September 2017. Photo Exhibition – Now open. Kick into high gear and visit the Singapore GP and Singapore Airlines showcase, Pit Stop @ Orchard (in front of Wisma Atria and Ngee Ann City) till 19 September. Take a walk down memory lane, and embark on a nostalgic trail at a photo exhibition showcasing iconic moments at the Marina Bay Street Circuit since its debut in 2008.
your own Formula 1® car. For more information, visit https://www.singaporegp.sg/fanzone/pre-race-activities. on exclusive tenth year celebratory designs on pins, t-shirts and tote bags. 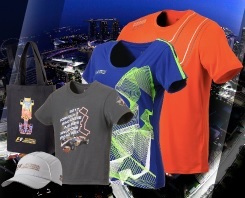 You can also save up to 15% when you purchase your Singapore GP merchandise online at shop.singaporegp.sg. Get your hands on Singapore Airlines F1® merchandise including 3D race car puzzle models, mini wireless speakers in the shape of turbine engines, polo tees, magnet gift sets, key rings and pen gift sets, which will be available for purchase at the merchandise store. KrisFlyer and PPS Club members will enjoy an additional 10% discount. SIA F1® merchandise can also be purchased inflight and online at www.krisshop.com/F1 for pre-order and home delivery. Design your own Formula 1® car at a brand new interactive exhibit. Choose from a variety of colours or animations and see your work of art come to life in real-time on a Formula 1® car replica using innovative 3D projection mapping technology by Trinax Media Group. Look out for a specially-commissioned kaleidoscopic collage-style animation by local motion graphics artist Reza Hasni. Share your stylised car on social media and stand to win exclusive Singapore GP merchandise and passes to the Thursday Pit Lane Experience (14 September). For more information on the locations of the installation, visit www.singaporegp.sg/revupsingapore. Join Singapore GP and Singapore Airlines for a fun-filled evening and check out the amazing variety of automotive power on display at the Racing Hearts charity drive event at the F1 Pit Building on 26 August from 5pm to 9pm. Catch drifting demonstrations by top Formula Drift driver Kenshiro Gushi, view a stunning display of supercars, try go-karting, go behind-the-scenes on a circuit tour, shop at a charity garage sale, attend free drumming workshops and so much more, all while helping to raise funds for Community Chest. Visitors can also catch ONE FM deejays race with the public on go-karts under the Formula 1® track lights. Over 100 Community Chest beneficiaries will experience a luxurious ride around the Marina Bay Street Circuit in a special collaboration with Ferrari Owners Club Singapore, McLaren Singapore, Porsche Club Singapore, Scuderia FSG and Heritage Car Club. The convoy will feature over 100 cars of various marques, including a Ferrari 458 Speciale, McLaren 650S, Lamborghini Huracán and Porsche 911 GT3 RS. The vehicles will then form up at the Pit Straight to allow members of the public to view them up close. Admission is free. Some activities are at a nominal fee of $5 to $20, with proceeds going to the Community Chest. For more information, visit www.singaporegp.sg/revupsingapore. 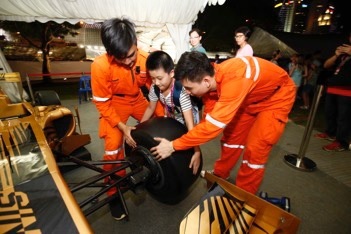 Be part of the winning experience at Singapore GP’s Pit Stop @ Raffles City. 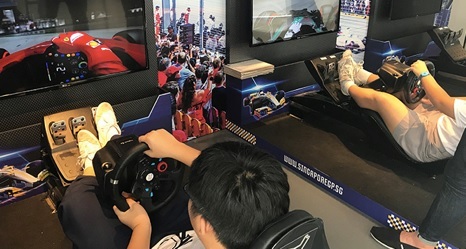 Take pictures on the mock podium, pose with the coveted trophy at the augmented reality photo booth and take a walk down memory lane with the Singapore GP champion’s gallery featuring the drivers who conquered the grueling Marina Bay Street Circuit since 2008. 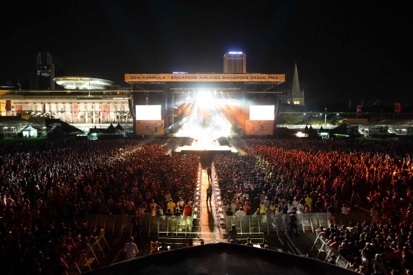 Take part in Singapore GP’s Meet and Greet contest and stand a chance to win the opportunity to get up close to your favourite headlining artiste – Calvin Harris, OneRepublic, The Chainsmokers, Lianne La Havas, Duran Duran or Seal! Simply register your ticket transaction number and submit a creative reason why you should be picked as a winner at www.singaporegp.sg by 3 September 2017 (11:59pm Singapore time). 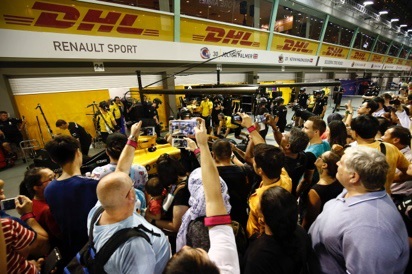 Here’s your chance to walk the Formula 1® Pit Lane and get up-close to your favourite teams! 3,000 Singapore residents will get this exclusive opportunity and enjoy an up-close view of the race cars and the pit crew in action at the team garages on Thursday, 14 September, a day before the Circuit Park opens. Visitors will also enjoy performances from roving artistes, try their hand at interactive activities and shop for official merchandise at the F1 Village. Ballot for complimentary passes till 27 August at www.singaporegp.sg/revupsingapore. September, including Plaza Singapura (27 to 29 Aug) and Kolam Ayer Community Centre (9 Sep). For more information, visit www.singaporegp.sg/revupsingapore. Take part in contests on the official Singapore GP Facebook, Twitter and Instagram platforms (@F1NightRace) and stand to win exclusive goodies from Singapore GP. To be kept updated on the latest news, download the official Singapore GP mobile app (iTunes and Google Play) for your personal race weekend guide to the 2017 FORMULA 1 SINGAPORE AIRLINES SINGAPORE GRAND PRIX. Racing back with a bang, Singapore Tourism Board’s Grand Prix Season Singapore (GPSS) is set to light up the city with a blockbuster line-up of festivities and vibrant lifestyle experiences, ranging from the exciting, parties and entertainment, to world-class shopping and dining. For more information, visit www.visitsingapore.com/gpss.